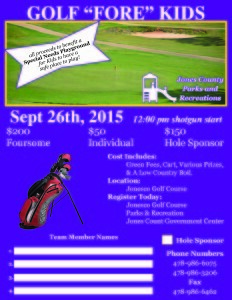 Jones County Parks and Recreation is hosting GOLF “Fore” KIDS on Saturday, September 26th, 2015 starting at 12 noon. 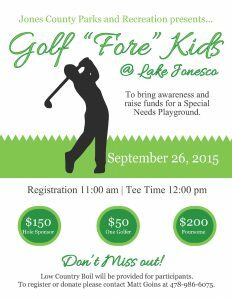 All proceeds will be to benefit a Special Needs Playground to ensure all kids has a safe place to play. For more information, please contact the Jones County Parks and Recreation at (478)986-6075 or (478) 986-3206. Theme: Don’t Wait. Communicate. Make Your Emergency Plan Today. September is National Preparedness Month. This year we are asking you to take action now – make a plan with your community, your family, and for your pets. Plan how to stay safe and communicate during the disasters that can affect your community. We ask everyone to participate in America’s PrepareAthon! and the national day of action, National PrepareAthon! Day, which culminates National Preparedness Month on September 30.